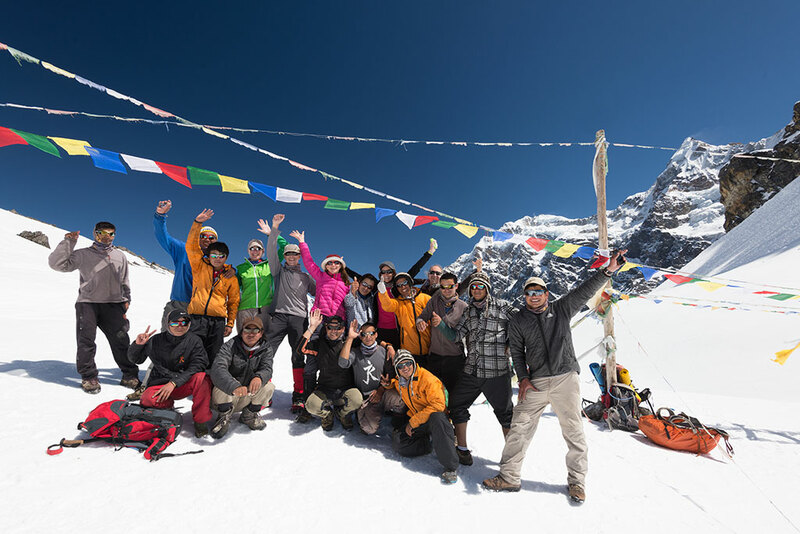 To start, there’s getting there, a 2-3 day journey to Nepal’s far east. Our Kamzang Journeys trekking team flew into Bhadrapur, in Nepal's steamy terai, to start our trek along the Great Himalayan Trail. Here, in furthest reaches of southeastern Nepal, the locals speak a mix of Hindi and Nepali, the people are Hindu and colorful local vegetable markets stock tropical fruits. We prayed to not contract malaria in sweltering, rural Bhadrapur, not having brought along malaria prophylactics for a trek in the Himalaya. 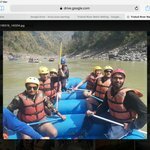 From Bhadrapur the adventure began as we wound our way up and down narrow, precipitous roads in our hired jeep, which immediately dropped back down to the steep-sided river valleys having switchbacked up 2000 meters to cross the numerous ridges. Finally we reached the tea-station of Ilam, one of Nepal’s best-kept secrets for Westerner tourists although well known to Nepalis. If you arrive at the right time of year you will catch the local carnival, complete with traveling ferris wheel; otherwise, tour the beautiful tea plantations, sample local teas and sweets and enjoy one of Nepal’s scenic hill-stations. 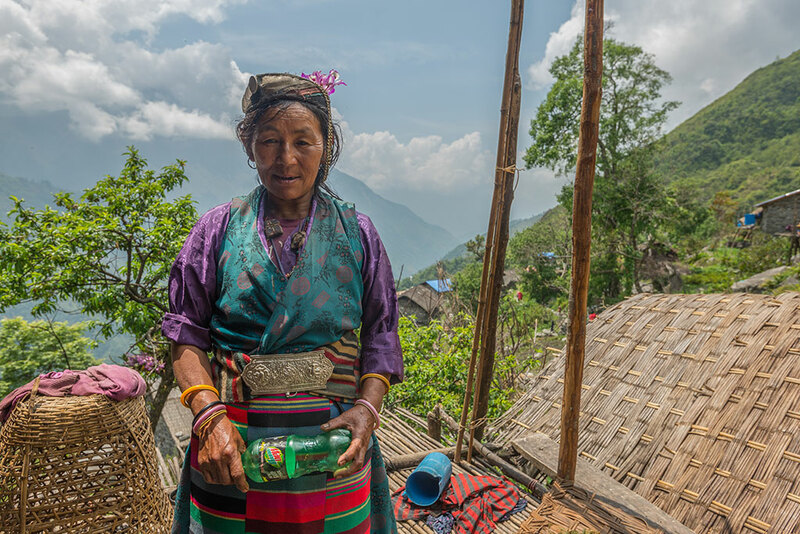 Sherpa woman in one of the local villages near Makalu. After another day of undulating roads we arrived at Taplejung, the start of our epic Kanchenjunga to Makalu Barun trek, part of a new route connecting the highest trekking routes in Nepal from east to west. 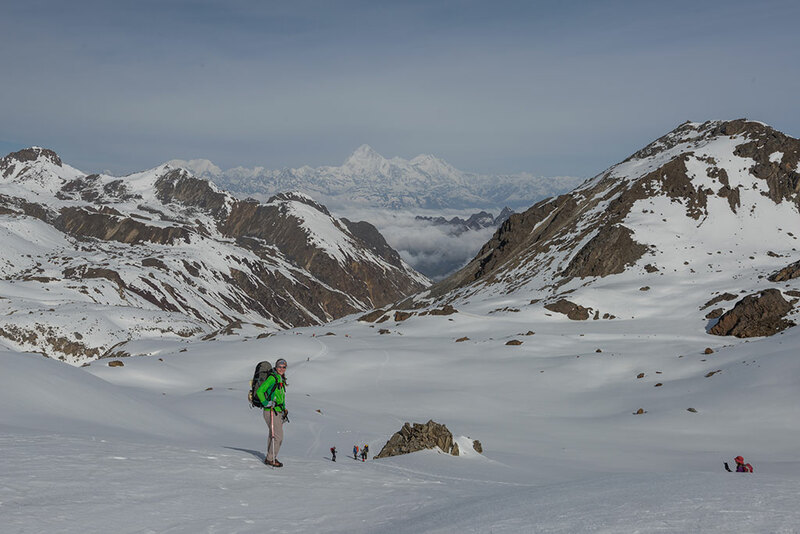 We started this trek close to the eastern end and trekked through past two of the world’s highest mountains, Kanchenjunga and Makalu, heading towards the eastern approaches to the Everest region. 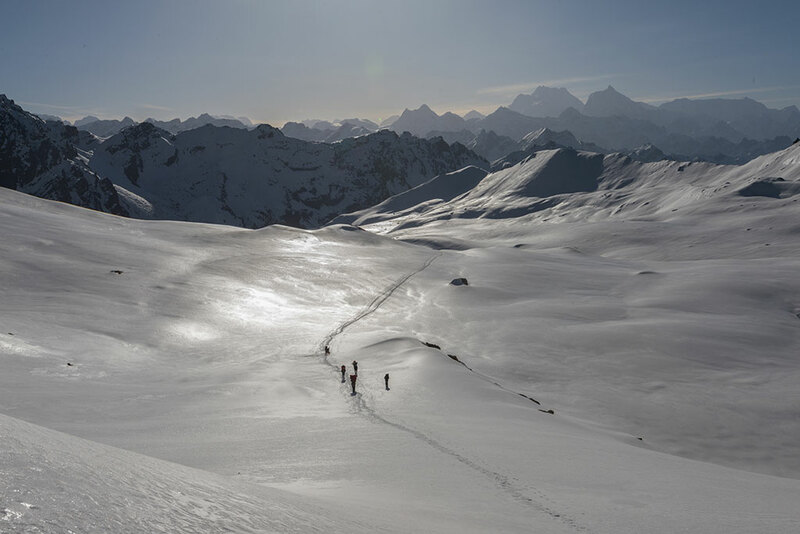 This later route, from Tumlingtar, was the only trail to Everest for early mountaineers such as Shipton in the first half of the 20th century. The Kanchenjunga and Makalu regions are inhabited by Limbu, Sherpa, Tibetan, Rai, Gurung, Magar, Newar and Tamang ethnic groups, the lower sections blanketed in hillsides of cardamom, throughout endlessly fascinating. The villages were first Limbu and Rai, and higher up Sherpa and Tibetan as we climbed steep trails, crossed landslides, avoided dangerous rock falls and made it to the sublimely beautiful Pang Pema, or north Kanchenjunga Base Camp. We experienced the 25 April earthquake in one small Sherpa village, barely avoiding a large rockfall, and although the muddy, exposed trail under our feet as we hiked high on exposed trails shook violently, we were only vaguely aware of the destruction in other parts of Nepal. One of the many highlights of the Kanchenjunga trek was crossing the snowy Nango La pass, sinking in up to our waists as we descended through rotten snow, and finally camping at remote Olangchun Gola village, where the Tibetan villagers weave traditional carpets from hand-spun sheep wool, do ‘koras’ around their ancient Buddhist monastery and make some of Nepal’s best tongba (fermented millet beer). The Lumba Sumba pass, at 5160 meters, was other worldly, a sublimely beautiful pass featuring the majestic Kanchenjunga (8598m) to the west, and Makalu (8485m) to the east, the third and fifth highest peaks in the world respectively. 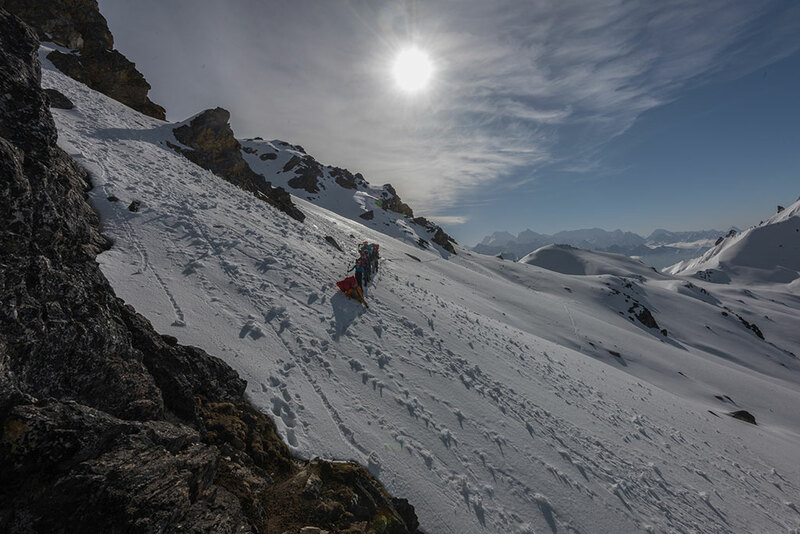 Reaching the high camp was an adventure in itself, breaking trail through snowfields along a snaking river in the mid-day sun, an exhausting task for the porters laden with our camping gear. We had an early morning start straight up an incredibly snowy slope, our hands on the deep snow steps that our staff broke trail the evening before. 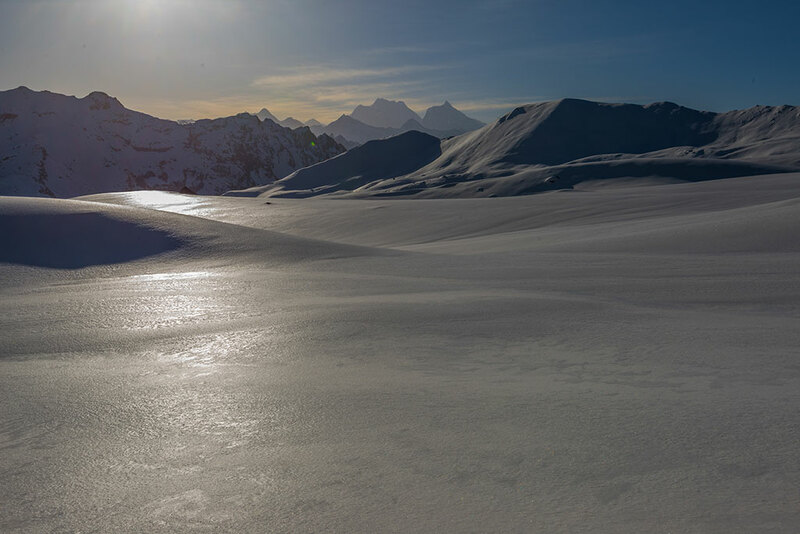 After crossing a large, pristine snowfield, the sunrise casting its rosy glow over the crusted world of white, we trekked up to the first of what we discovered was a double pass. We coined these the Lumba La and the Sumba La, connected by a somewhat dangerous, narrow and precipitous trail. 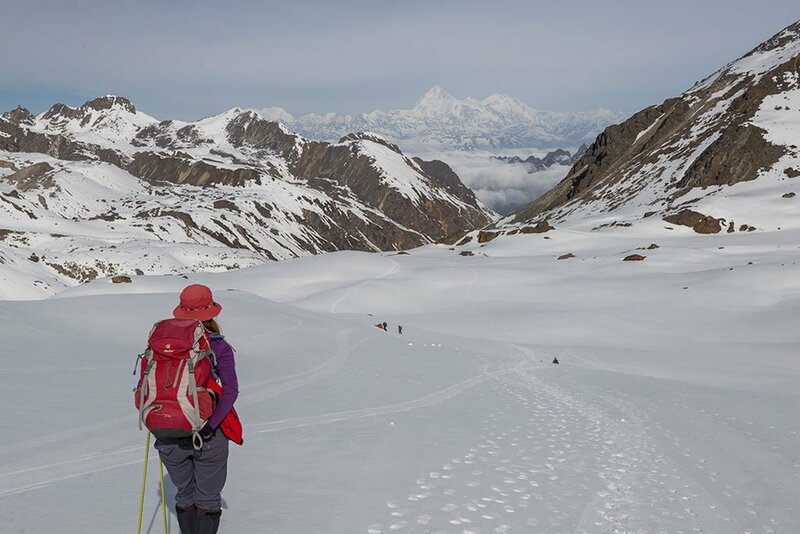 After admiring the incredible Himalayan panorama from the top of the pass the fun began as we glissaded, or alternatively slide on pack covers, down the western snowfields, an exciting entrance into the Makalu Barun region. The Makalu region features the Arun and Tamor rivers, massive river systems which flow from the high Himalayan glaciers and over the millennium have formed deep gorges, now farmed and populated with villages. This part of the trek was much more remote, and our adventures continued as we experienced the second of the two major April and May Nepal earthquakes in a village high above a steep-sided river valley. We continued with our Tamang porters to climb and descend on narrow stone steps hundreds of meters above the valley below, on barely visible trails, a tangle of rocks, tree roots and old tree trunks made into bridges that I could barely look at, let alone cross. With no choice but to continue, we trekked up and down through the shaking landscape, the descents exhaustingly slick, steep and muddy. We passed through beautiful Sherpa villages, the woman dressed traditionally in their striped aprons but wearing silver jewelry which was more akin to their Rai and Limbu sisters. The villages were green with ripening crops of barley, wheat and green vegetables on terraced field, brightened by marigolds, and the architecture was typical middle hills bamboo dwelling with large porches for drying beans and greens. At the largest of these villages, we were hit by the second large earthquake of 12 May which sent the hillside across the steep valley plummeting to the river. Finally, we again reached green fields of cardamom and neared the end of our month-long journey along the eastern Great Himalayan Trail, during the month of earthquakes in Nepal. Nango La Pass with the group.